What’s better than experiencing the natural scenic beauty of Canada’s Rocky Mountains and the national Parks of Alberta? Not much, except maybe an experience that is tailored to what you and your friends’ abilities are, and what you’d like to do and see. 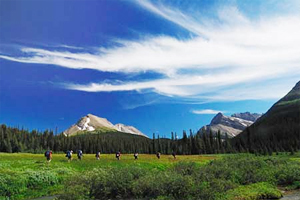 Many tour companies in the Canadian Rockies operating out of Banff, Alberta, Jasper, and here in Canmore offer group tours and packages for all manner of outdoor activities. Most of these t0ur guides also offer private guided tours for your outdoor experience in Alberta’s backcountry. Most of the activities you see listed here – backcountry skiing, ski mountaineering, ice climbing, mountaineering, rock climbing, hiking, trekking, backpacking – can be done with a private guide. In fact many tour companies will tailor a trip for you or your group, so you can have a one-of-a-kind outdoor experience in Banff National Park or elsewhere in Western Canada. The pace of the activity, the degree of difficulty, and the level of service and comfort is customized to the needs and abilities of you and your group – it will be virtually impossible not to have fun! We can recommend the guides at Yamnuska Mountain Adventures if you’re looking for a private guided tour in the outdoors of Western Canada. While Yamnuska specializes in mountaineering, rock climbing, backcountry skiing, ski mountaineering and hut-to-hut traverses, as well as day-hikes and multi-day backpacking trips and trekking in the warmer months. 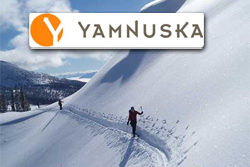 Equipment rental, food — Yamnuska will even assist you with arranging local transportation.